A few weeks ago I talked to my friend, TJ, about life as an international student. If you missed that blog, you can find it at here. This week I decided to turn the tables and catch up with my friend Grant, an international school teacher, with amazing experiences from around the world. Let’s jump right in and ask a(n) international school teacher! Well, to start us off, where and what do you currently teach? 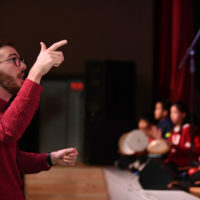 I teach General Music in Beijing, China. Currently I work with grades 2-5, but I’ve taught K-12 music at my previous schools. I’m a week away from finishing my 5th year! Wow, that’s awesome! Congrats! Why did you decide to become an international school teacher? While at undergrad, my school had an informational dinner about completing the required student teaching overseas. I went to the dinner and thought it sounded like fun. My initial thought was “it will be so wonderful to go do my student teaching in Europe!” but that’s not really how it worked out. The only school that I could get a placement at was in the Philippines (not very high on my list initially, but it ended up being amazing!). So I decided to go to Faith Academy in Manila, Philippines for my final semester of school to complete my student teaching. After just a few weeks in Manila, I knew that teaching overseas was what I wanted to do for the foreseeable future. Now here I am finishing up year 5 and I’m still loving it! So really…you just went for the free food and wound up becoming an international teacher. Ha! You started off in the Philippines, so where have you taught since then? Hey, I’m always about free food! But this is probably the most life changing free food I’ve ever gotten. I’ve taught in: Kabul, Afghanistan; Dubai, UAE; and Ho Chi Minh City, Vietnam. It sounds like you’ve had quite the variety of international experiences! What are some things you’ve come to find as unique to the teaching experience at an international school? I hear stories from a lot of my friends back in the States about how awful the resources are. This isn’t really something that I’ve run into at an international school yet. There are obviously different calibers of schools all across the world, but for the most part, international schools tend to be fairly well-funded. This helps in many areas of the schools success and resources. What then is your favorite part about teaching in an international environment? Being able to have students from so many different countries and cultures in one room is such a blast. It’s always so cool to see how their individual cultures blend while working on projects together and the creativity that comes from it. Also, living internationally gives me the opportunity to travel to so many awesome places. I definitely wouldn’t be traveling so much if I was living and working back in the States. Yeah, I mean life as an expat in general provides so much intercultural interaction. I can imagine how cool that would be to see it played out in the classroom! On the flip side of that, what’s the most difficult part about teaching at an international school? Definitely, without a doubt, my single biggest struggle is being away from my family. As an uncle to 11 nieces and nephews all under the age of 12, I feel like I’m missing out on a lot back in my hometown. Then again, as a teacher I get to use my summer and winter breaks to go to my hometown and soak in a whole bunch of family time. 11 nieces and nephews?! Your breaks sure sound busy and fun! What do you think is biggest way you’ve changed since becoming a teacher at an international school? I would say that teaching internationally has made me a much more independent person. Moving to a country where you know zero people, you can’t speak the language, and you’ve got two weeks to get ready for the school year can really kick you into overdrive. But I’ve seen myself grow in independence over the last few years and I think a lot of it has to do with the lifestyle that comes with international teaching. Looking back on your first teaching job, what are some things you wished someone had told you before you started teaching internationally? That’s an interesting one! It might be different for me since I have never done any teaching in the States, but I would have to say I wish I had been told about the level of isolation that someone can feel while living abroad. When I went to college, I was 4 hours away from my hometown and a 10-minute drive away from my sister who lived in the next town over. This meant that I saw my family very frequently and that obviously doesn’t happen now. Moving to Kabul was the single biggest change I have ever made. Thankfully, my first school had an amazing community of teachers, but the loneliness still set in quite a bit at the beginning. Although it is not even relatively close to what it was like that first semester, this is for sure something that still hits me occasionally, even in year five of teaching abroad. As we start to wrap up our conversation, what are some tips you have for any of our readers who may be teachers thinking of entering into the international school scene? Do it! It’s one of the best decisions I’ve made! It may take a leap of faith to begin with, but the schools can be amazing, the ability to travel, the cultural experiences—it’s all so great! I would definitely suggest extensively looking into the school that you are thinking about going to before you sign a contract. It’s not always possible to tell the real feel of a school until you are actually there, but there are a few resources online of anonymous staff and student reviews of schools. These can be really helpful. On a very practical note, what are some good resources you know for finding schools around the world? The single biggest thing in finding schools is using an agency. You might think “Agh, I’ll just look some up on my own.” Let me tell you from personal experience, it’s 100% worth the fee for joining the search agencies. All but my latest placement have been with a company called International School Services. I would highly recommend them and their job fairs for anyone in the market and looking for a job. Even if you aren’t able to attend one of the job fairs, they are super helpful with finding you a placement that’s a great fit for you. They are extremely professional, very thorough, and are connected to a ridiculous number of schools. The other company that I know many of my past and present coworkers have used is called Search Associates. I personally haven’t used them, but I have heard many good things about their company as well. To finish, do you have any thoughts for curious readers on where you may want to go next? I really enjoyed my time while I was in the Middle East, and I’d definitely like to end up back there some day, but I’m really up for an adventure wherever it presents itself! Well, Grant, it’s been great getting to hear more about your experiences as an international teacher, thanks! Best of luck with finishing out the school year and wherever your next teaching adventure may be! Do you have any thoughts or questions on life as an international school teacher? Post in the comments below and we’d love to get back to you! Check out next week’s Ask a… post and if you have someone you want to be interviewed, send a note to blog@middle-kingdom.flywheelsites.com. It may take a leap of faith to begin with, but the schools can be amazing, the ability to travel, the cultural experiences—it’s all so great!